Winter is here! The thin layer of ice appearing early in the morning at our lake’s shoreline is a sign of the change in the weather. This is the time of year when I think about what has happened on our lake and how to make plans for the future. Lake life is beautiful, peaceful and enjoyable in every way. Sometimes, as we all know, life throws us a few curve balls and changes our plans that have been carefully set. Evaluating what is occurring concerning our lake is the constant job of the SDRA Board of Directors. We look at a situation and discuss it from many angles — talking about different ideas and not always agreeing– but each Board member is treated with highest respect for his/ her opinion. We strive to develop a path that the majority of ALL SDRA members will be comfortable following. NO one choice makes everyone happy ! Doing nothing — improves nothing; waiting — only postpones a decision– and just to change and do something only improves a situation for a short time. That is what appears to have happened before: expensive chemicals killed the weeds for a short time, and now they are back. We did not have a plan for continuous control. Currently, there are several plans working to control weeds: drawdown, cleanup of pollutants, boat inspection program, suction harvester, hand weed pulling, a Lakesmart Program, and others. The decision to use or not use chemicals is up to the majority – but- everyone needs to be involved and do something no matter the decision. Our vote will help the Board determine the direction to follow before we have to take the next curve. There is much work to be done, many conversations to have, and final decisions to make. I sincerely recommend that you get involved — call a Board member for ideas how. The autumn was busy for the executive board of Sand Dam Reservoir Association. We’re working closely with the Lake Management Committee to formulate a series of strategies to mitigate the invasive weeds in Smith & Sayles Reservoir. To do so, we hired ESS to return to our lake, survey the 184 acres, determine changes that have occurred since our last survey in 2015, and share their recommendations. You can see that report on the Lake Management page of our Sand Dam Reservoir Association website. We’ve also been networking with other Associations and agencies to determine some long-term practices to maintain the lake water quality. Of interest has been a possible LakeSmart program in conjunction with Save the Lakes and other interested groups. This program recognizes waterfront homeowners who use natural landscaping strategies to protect the health of their lake. We’ll be investigating that program further and hope to be able to work alongside DEM so that Smith & Sayles Reservoir becomes a model for an education and reward program. We’ll acknowledge and celebrate lakefront property owners who maintain their homes in ways that protect lake water quality and property values. I learn so much from each of you as we work together toward protecting our much-beloved lake. I am in awe every time I see one of you, my neighbors, pulling or raking out invasive weeds at the lake’s edge while the drawdown is occurring. You are truly making a difference. Happy holidays to you and your cherished ones. In this season of being grateful, I feel blessed to be part of a group of hard-working and dedicated individuals who serve on the SDRA Board. Our monthly Board meetings are productive and respectful. We are all collaborating to protect and preserve our beautiful lake. The SDRA website (https://sanddamreservoir.com/) and quarterly newsletters are designed to keep members informed about our efforts. If you know somebody who would like to be added to our mailing list, please forward their email address to SDRA.secretary@cox.net. As the 2017 year is nearly behind us, it’s nice to look back and see how many Association members taken an active role in our lake’s future. Many of you have attended some of our meetings and have expressed some very valuable viewpoints. We may not all agree at times, but we need to respect each member’s opinion and know each person’s voice is as important as the next. As the Association’s Treasurer, I am aware of our need to maintain a healthy financial picture. We have already begun planning for next year’s fundraising events. For those of you who attended this year’s Wine Tasting and Dinner at Bella’s Restaurant, I think you would all agree it was a great success. We had so much positive feedback that we have already set April 14th, 2018 aside for a repeat performance. So Save the Date, and I look forward to a very positive and productive new year. One of the things I love most about living here is how different our weather can be from season to season. With fall deeply upon us and winter just around the corner, the foliage has been stunning. So, my only update this quarter is just a bit of advice, which is to get outside and enjoy the chilly air and breathtaking view before we get plummeted in snow. Maybe enjoy your morning cup of coffee or afternoon tea outside. For me, that means hanging outside (coffee in hand) chasing my boys around. There’s not much that beats the sound of children laughing. Have a wonderful holiday, everyone! A recent report from ESS Group highlighted some items we already knew, and pointed to some new invasives we did not know were in our lake. The report also commented on potential pathways forward and provides solid guidance as we pursue a multi-pronged approach to managing aquatic invasives. The lake management team intends to use ESS Group’s recommendations to apply for a final maximum drawdown depth of sixty inches. An analysis comparing our current fifty four inch maximum drawdown depth to a sixty inch maximum drawdown depth suggests an additional eleven acres could be subjected to freeze drying for milfoil control. We intend to pursue this action in conjunction with DEM biologists so ensure we can legally and safely approach such a drawdown depth. Board and lake management members attempted to meet with DEM biologists to begin the permitting process in November, but were unsuccessful in gaining traction then. DEM representatives recently hinted we may be able to meet in December of this year. The report, available on SDRA’s web site, is quite interesting. You are encouraged to read it. Contact a board member or me if you would like a printed copy. See https://goo.gl/9hJFKL to access the report directly. You should have received a ballot to vote whether SDRA should or should not pursue the possibility of applying herbicide treatments to invasive weeds in Smith & Sayles Reservoir. If you did not receive this ballot, please contact Judy Colaluca at 568-4267 or Carolyn Fortuna at 309-3399. As a Reminder: Paper ballots are due to SDRA, PO Box 284, Chepachet 02814 by midnight on December 31, 2017. Feel free to contact any Board member if you need more information. Recreational boating is one of the main methods of transporting aquatic invasive species like the variable milfoil and swollen bladderwort that the ESS group identified on our lake. The SDRA Voluntary Inspection Program works to prevent the spread of aquatic invasive species by educating visitors at our boat launch about the importance of careful inspection and cleaning procedures. While we have not yet analyzed data from fishing tournaments that we worked during the summer 17 season, past years show that about 20% of boats arrive for the tournaments “dirty” – that is, with some potentially invasive plant material on the boat or trailer upon arrival at the boat launch. I hope you will consider joining this volunteer effort during the summer 2018 season. In spite of October’s deluge, the drawdown is finally near its maximum allowable depth. You can improve the drawdown’s efficacy by removing milfoil from the exposed lake bed in front of your property, and by hoping for deep freezing before the lake bed is snow covered. You are encouraged to view the frequently updated drawdown measurements and lake level charts at https://goo.gl/2C9u2K . A special thanks to Rico and Mike for their efforts at managing the lake level and keeping SDRA in compliance with DEM regulations. 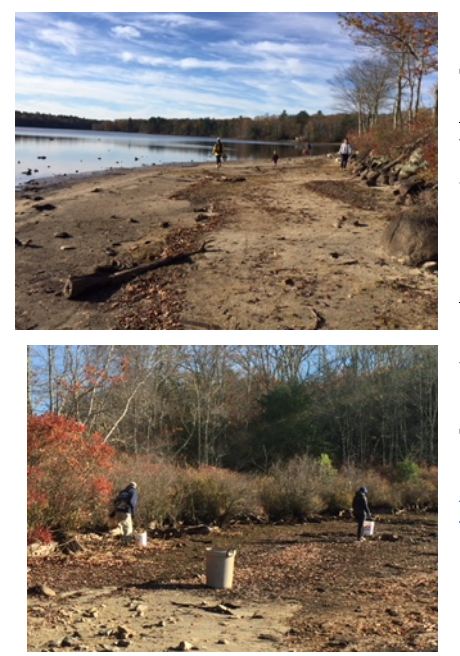 The November 4, 2017 dam cleanup was a success! 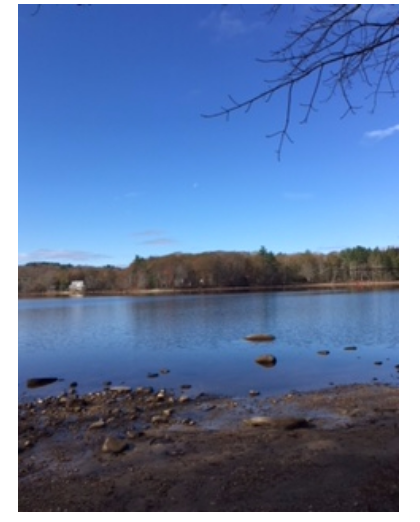 Although the weather was cold, the skies were clear and blue, and around 25 community members joined together to pick up the litter and trash on the dam and the adjoining areas on Chestnut Hill Road. And the event made the news. Did you see the article in The Breeze? It featured our own treasurer, Eric LaRiviere, who spoke out in favor of local laws that require people to cover trash as it is being transported to the Glocester Transfer Station. You can read the article here. If you’re interested in reading RI Chapter 31-25-10 – Fastening of load and covering– law, click here. This committee has been meeting monthly since October in the hopes of locating and applying for grants that will help us with several long-term sustainability projects on the lake. It seems that the application window for most 2017 grants has closed right now, but that isn’t stopping us! We continue to brainstorm ideas, make requests at other organizations and foundations, and network. We are hopeful that our persistence will pay off in the new year. We’ll keep you posted with any updates as they occur, and please share in any grants of which you might be aware. The holidays are here, and why not give the gift of a donation? The GoFundMe page is active and accepting donations. The is just another avenue to reach out and collect money especially as we gear up our fundraising efforts this year. Please visit and share the page https://www.gofundme.com/sanddamri. Every little bit helps. Also, for anyone that would like to give a donation in someone’s name as a gift, I can give you a festive card that you can give to the person. Thank you, and happy holidays! Recently, members of Keech Pond built a concrete rim over the outlet pipe on our side of the dam to prevent washouts. Also, discussions continue regarding drawdown, as the amount of water released from Keech depends on our weather. Invitation For Candidates: It’s never too soon to start thinking about who you want to lead your lake association in the future. The Nominating Committee invites you to submit the names of those you would like to serve as officers or as members of the board of directors well before the next annual meeting. Officers serve a two year term and board members serve for three years. Only one person from each household may serve as an officer or member of the board simultaneously. The officers and board members meet once a month, usually for about 90 or so minutes. They also are in frequent contact throughout the month by phone or via e-mails. Not everyone feels comfortable being an official candidate. If you want to be of service to your lake community in another capacity, whether fundraising, lake management, learning how to operate the suction harvester, joining in on boat inspections during bass tournaments, or organizing Sand Dam Day, please let any officer or board member know. Our lake needs constant support from the members of Sand Dam Reservoir Association to thrive. The more people participate, the stronger and more effective our organization will be. 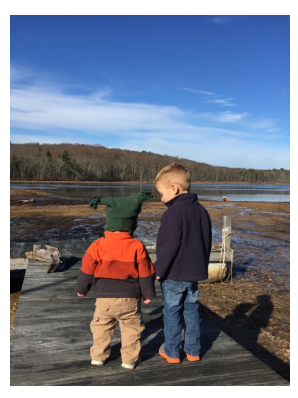 Save The Lakes will be proud to co-sponsor our own adaptation of Maine’s Lakesmart Program, mentioned previously in this newsletter. As waterfront landowners, we control what goes directly into our lake! There are ways to protect our water, and the Lakesmart Program offers alternative ways to improve our water quality benefiting “ALL” our environment. As always,”Thank you.” It is my pleasure to be President of SDRA! It is my honor to be a team member working with such a dedicated group of volunteers!! Thank you! Mike, Art, and Rico, your hours and dedication to a smooth drawdown is a testament to your concern and love of our lake. Thank you. I wish each of you a wonderful Christmas!! May 2018 be a year of peace and contentment!!! This entry was posted in Community Advocacy and tagged Invasive species, Lake Management, Sand Dam Reservoir, Save The Lakes, Smith and Sayles Reservoir, Sustainability. Bookmark the permalink.